Flour is a pantry staple. It is a primary ingredient in baking and is also widely used for cooking. However, with all the types of flour available on the market today, it can be quite difficult to choose which one to use. 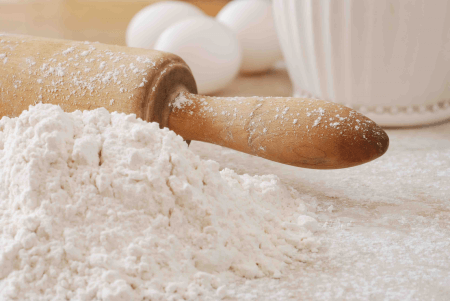 Two of the most common types are bleached and unbleached flour. What is the difference between the two? This will be discussed in this article. Perfect for soft fluffy baked goods such as quick bread, muffins, pancakes, waffles, cookies and pie crusts Perfect for baked products that rise like strudel, popovers, pastries, puffs and yeast bread. Bleached flour, as the name suggests, is a type of flour that goes through a bleaching process. This process involves the use of maturing and bleaching elements such as potassium bromate, ascorbic acid, benzoyl peroxide and chlorine gas. Although the main purpose of the bleaching process is to speed up the aging of the flour, it also affects the color and the protein content of the flour. The result is soft (because of the lower protein level brought about by the bleaching process), white and fine-grained flour. The color and composition of bleached flour are not only apparent in the flour itself, but are also evident in the final baked product. Products that are made with bleached flour are noticeably fluffy, soft, and bright. People with sensitive palates may also notice a bitter aftertaste in the baked good due to the traces of maturing agents in the flour. Bleached flour is perfect for soft baked goods like quick bread, muffins, pancakes, waffles, cookies and pie crusts. On the other hand, unbleached flour is a type of flour that matures naturally. It does not go through an artificial bleaching process, so its color is a lot more similar to the natural color of wheat, which is off-white. Although it eventually becomes lighter as it ages, unbleached flour does not become stark white. Unbleached flour is dense. It also has a high level of protein, which makes baked products rise. Because of its density and high protein content, many bakers use it for baked goods that need that “rise” and structure. This type of flour is perfect for strudel, popovers, pastries, puffs and yeast bread. Moreover, the natural aging of the unbleached flour takes a long time. Because of this, it is more difficult to produce and more expensive than most types of flour. What, then, is the difference between bleached and unbleached flour? Bleached flour is a type of flour that goes through a chemical bleaching process to speed up its aging, whereas unbleached flour is a type of flour that is aged naturally after it is milled. Bleached flour is soft (because of its lower protein level brought about by the bleaching process), white and fine-grained. It results in soft, bright, and fluffy baked goods. On the other hand, unbleached flour is off-white and dense. It results in a more structured baked product. Bleached flour is perfect for soft fluffy baked goods such as quick bread, muffins, pancakes, waffles, cookies and pie crusts. Unbleached flour is perfect for baked products that rise like strudel, popovers, pastries, puffs and yeast bread. Moreover, unbleached flour is typically more expensive than bleached flour. It also has a higher protein content than bleached flour.